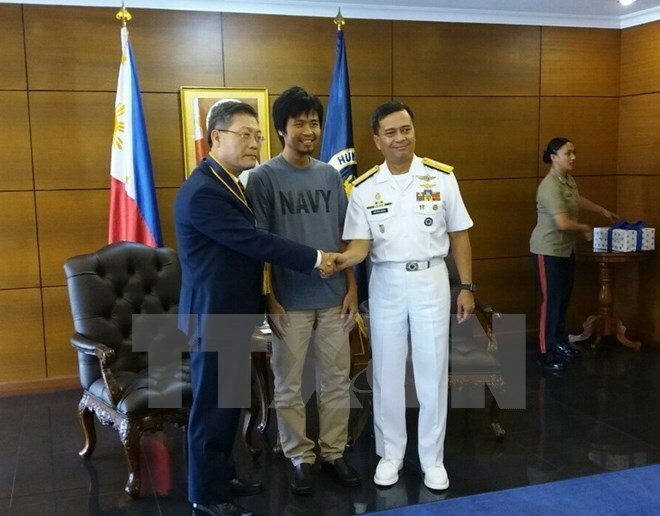 Manila (VNA) – The Philippines’ navy handed over to the Vietnamese Embassy in the Philippines a Vietnamese sailor who was recently rescued from the terrorist group Abu Sayyaf by the host country’s military. Vietnamese Ambassador to the country Ly Quoc Tuan met Philippine Navy chief Vice Admiral Ronald Joseph Mercado at the Philippine Royal Navy Command headquarters to receive Do Trung Hieu on August 23. Hieu was among 19 sailors on board the Royal 16 ship which was kidnapped by the pirates off Sibagu island of Basilan, the Philippines, in November 2016. After that the pirates released the ship and 13 sailors, retaining six including Hieu. The five other sailors are Captain Pham Minh Tuan, Hoang Vo, Tran Khuong Dung, Hoang Van Hai and Hoang Trung Thong.